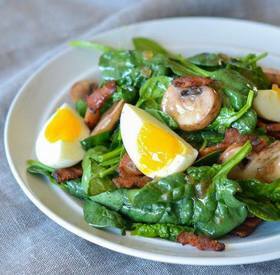 Spinach salad w/ bacon & egg! I wanted to make a salad for dinner that my family would be excited to eat and I thought what could make this even better…. hmmmm…. oh maybe BACON! Oh yes, Bacon would do it. The tangy red wine vinaigrette comes comes together in just a few minutes and brightens all the flavors, so you can have a delicious and healthy dinner on the table in just 30 minutes!